If your locked out or have a broken Union Lock. 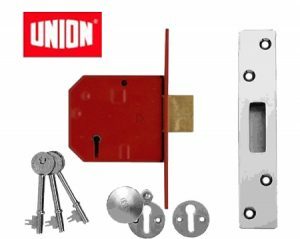 This is a picture of a 5 lever Mortice Deadlock Lock, commonly referred to as a Union Lock. Early in the nineteenth century, new firms were established and many of the original smaller manufacturers expanded, gaining international recognition as household names. Chubb were famous for producing high quality locks and making the Detector Lock from 1818, a lock which both prevented picking and was capable of showing the owner whether it had been picked. Trading under the name Union and based at the Union Works, Josiah Parkes advertised in the Wolverhampton Guide of 1864 as ‘a manufacturer of all kinds of locks’. By 1860 the industry was virtually confined to Willenhall and Wolverhampton with around 90% of the locks produced in England being made here. However by then 85% of locks were produced by the large factories rather than backyard workshops. In 1911 Parkes began the manufacture of cylinder locks and latches, which we now refer to as ‘Yale locks’. At the time comparatively few were being made in this country. The American company, Yale, actually only began manufacturing locks in England in 1929 when it took over Willenhall’s H & T Vaughan Ltd. Yale inherited a ready-made work force and production facilities for manufacturing cylinder locks.